Challenge: This company was contracted to build a unique combat training structure for Nellis AFB. Solution: They had worked with Panel Built before, and chose them with confidence to produce a superior product that satisfied the design requirements, time frame and price for the project. Panel Built Delivers: A custom designed three story air-attack training tower with welded rappel stations, climbing walls, and roof with hatch. Tower is built to withstand 160 mph winds. 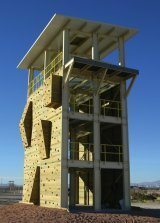 Project Specs: 16 x 26 three-story air attack training tower with rappel and climbing walls. 125 psf live load capacity. L/240 total load deflection. L/360 live load deflection. OSHA standard stairs and handrail. 160 mph windloading. Slip resistant steel bar grating deck surfaces. Security fence with access doors around ground level perimeter. Custom designed rappel hitching posts, fast rope slides and winch slide.